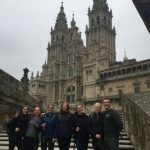 UTracks, the active Europe specialist, has wrapped up its eight-day Camino famil in Spain which saw seven lucky travel professionals walk the final section of the world’s most famous pilgrim route. 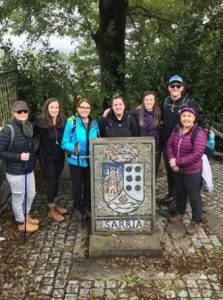 Led by Jacqui Henderson from UTracks and in the company of an experienced local guide, the group walked the final 110km from Sarria to Santiago de Compostela. Provided you have the right gear, autumn is an ideal time to walk the Camino in Spain, with cooler temperatures and fewer pilgrims. And with the luxury of pre-booked hotel accommodation, breakfast and dinner each day and luggage transfers between towns, all the group had to worry about was enjoying the breathtaking landscapes, unique historical and cultural highlights and ancient villages along The Way. The group arrived in Santiago de Compostela, the final resting place of St James, in time for the pilgrim’s mass at the Santiago Cathedral, where they witnessed the swinging of the giant 1.5 metre incense burner, the “Botafuimera”. Weighing more than 50 kilograms, it takes seven men to swing the Botafuimera, on a rope and pulley system. The incense burner swings as high as 21 metres above the pilgrims and reaches speeds of up to 80 kilometres an hour. While normally used for liturgical reasons, legend has it that the swinging of the Botafuimera began in the 11th century to eradicate the smell of the pilgrims, who arrived in the Cathedral, tired and unwashed. However, this wasn’t an issue for this particular group of pilgrims, who had the benefit of hot showers and a comfortable beds at the end of each day’s walking on the Camino. 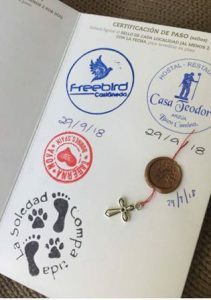 Completing the Camino famil came with bragging rights – by completing the last 110 km section of the Camino, the participants qualified for the official Compostela “certificate of completion”.